Formation of the Solar System Is The Construction Of Our Solar System. Formation and evolution of the solar system evolves over billions of years. Solar system formation theories concerning the origin and evolution of the Solar System are complex and varied. Solar system formation ideas interweave various scientific disciplines, from astronomy and physics to geology and planetary science. Over the centuries, many Solar system formation theories have been advanced as to its creation, but it was not until the eighteenth century that the beginnings of the modern theory took shape. With the dawn of the space age, the images and structures of the other worlds in our solar system refined our understanding, while advances in Nuclear physics gave us our first glimpses of the processes which underpinned stars, and led ultimately to our first theories of their creation and ultimate destruction. Initial Formation of the solar system. The Solar nebula. 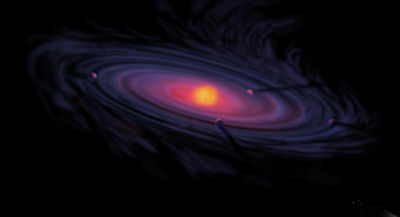 artist's impression of a protoplanetary disc forming the solar system. The current hypothesis of Solar System formation is the nebular hypothesis, first proposed in 1755 by Immanuel Kant and independently formulated by Pierre-Simon Laplace. The nebular theory holds that the Solar System was formed from the gravitational collapse of a gaseous cloud called the Solar nebula. It had a diameter of 100 AU and was 2-3 times the mass of the Sun. Over time, a disturbance (possibly a nearby supernova) squeezed the nebula, pushing matter inward until gravitational forces overcame the internal gas pressure and it began to collapse. As the nebula collapsed, conservation of angular momentum meant that it spun faster, and became warmer. As the competing forces associated with gravity, gas pressure, magnetic fields, and rotation acted on it, the contracting nebula began to flatten into a spinning protoplanetary disk with a gradually contracting protostar at the center. Studies of young, pre-fusing solar mass stars, caled T Tauri stars, show that these discs extend to several hundred AU and are rather cool, reaching only a thousand kelvins at their hottest. From this cloud and its gas and dust, the various planets formed. The currently accepted method by which the planets formed is known as accretion, in which the planets began as dust grains in orbit around the central protostar, which initially formed by direct contact into clumps between one and ten kilometres in diameter, which in turn collided to form larger bodies (of roughly 5 km in size), gradually increasing by further collisions by roughly 15 cm per year over the course of the next few million years. The inner solar system was too warm for volatile molecules like water and methane to condense, and so the planetesimals which formed there were relatively small (comprising only 0.6% the mass of the disc) and composed largely of compounds with high melting points, such as silicates and metals. These rocky bodies eventually became the terrestrial planets. Farther out, the gravitational effects of Jupiter made it impossible for the protoplanetary objects present to come together, leaving behind the asteroid belt. Farther out still, beyond the frost line, where lighter and more volatile compounds could remain solid, Jupiter and Saturn were able to gather together far more material than the terrestrial planets, as those compounds were far more common. They became the gas giants, while Uranus and Neptune captured much less material and are known as ice giants because their cores are believed to be made mostly of ices (hydrogen compounds). After 100 million years, the pressure and density of hydrogen in the centre of the collapsing nebula became great enough for the protosun to begin thermonuclear fusion, which increased until hydrostatic equilibrium was achieved. The young Sun's solar wind then cleared away all the gas and dust in the protoplanetary disk, blowing it into interstellar space, thus ending the growth of the planets. One problem with this hypothesis is that of angular momentum. With the vast majority of the system's mass accumulating at the center of the rotating cloud, the hypothesis predicts that the vast majority of the system's angular momentum should accumulate there as well. However, the Sun's rotation is far slower than expected, and the planets, despite accounting for less than 1 percent of the system's mass, thus account for more than 90 percent of its angular momentum. One resolution of this problem is that dust grains in the original disc created drag which slowed down the rotation in the center. Planets in the "wrong place" are a problem for the solar nebula model. Uranus and Neptune exist in a region where their formation is highly implausible due to the reduced density of the solar nebula and the longer orbital times in their region. Furthermore, the Hot Jupiters now observed around other stars cannot have formed in their current positions if they formed from a "solar nebula" too. These issues are dealt with by assuming that interactions with the nebula itself and leftover planetesimals can result in planetary migrations. The detailed features of the planets are yet another problem. The solar nebula hypothesis predicts that all planets will form exactly in the ecliptic plane. Instead, the orbits of the classical planets have various (but admitedly small) inclinations with respect to the ecliptic. Furthermore, for the gas giants it is predicted that their rotations and moon systems will also not be inclined with respect to the ecliptic plane. However most gas giants have substantial axial tilts with respect to the ecliptic, with Uranus having a 98º tilt. The Moon being relatively large with respect to the Earth and other moons which are in irregular orbits with respect to their planet is yet another issue. It is now believed these observations are explained by events which happened after the initial formation of the solar system. Estimation of age of the solar system. Using radiometric dating, scientists can estimate that the solar system is 4.6 billion years old. The oldest rocks on Earth are approximately 3.9 billion years old. Rocks this old are rare, as the Earth's surface is constantly being reshaped by erosion, volcanism and plate tectonics. To estimate the age of the solar system scientists must use meteorites, which were formed during the early condensation of the solar nebula. The oldest meteorites (such as the Canyon Diablo meteorite) are found to have an age of 4.6 billion years, hence the solar system must be at least 4.6 billion years old. Subsequent formation and evolution of the solar system. The planets were originally believed to have formed in or near the orbits at which we see them now. 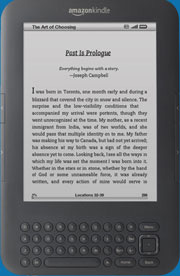 However, this view has been undergoing radical change during the late 20th century and the beginning of the 21st century. Currently, it is believed that the solar system looked very different after its initial formation, with five objects at least as massive as Mercury being present in the inner solar system (instead of the current four), the outer solar system being much more compact than it is now, and the Kuiper belt starting much farther in than it does now. Impacts are currently believed to be a regular (if infrequent) part of the development and evolution of the solar system. In addition to the Moon-forming impact, the Pluto-Charon system is believed to be the result of a collision between Kuiper Belt objects. Other cases of moons around asteroids and other Kuiper Belt obejcts are also believed to be the result of collisions. That collisions continue to happen is evidenced by the collision of Comet Shoemaker-Levy 9 with Jupiter in 1994, and the impact feature Meteor Crater in the US state of Arizona. Formation of the inner solar system. According to the currently accepted view, the inner solar system was "completed" by a giant impact in which the young Earth collided with a Mars-sized object (being the "fifth" inner solar system object alluded to above). This impact resulted in the fomation of the Moon. The current speculation is that this Mars-sized object formed at one of the stable Earth-Sun Lagrangian points (either L4 or L5) and later drifted away from that position. Formation of the solar system and asteroid belt. Under the solar nebula hypothesis, the asteroid belt initially contained more than enough matter to form a planet, and, indeed, a large number of planetesimals formed there. However, Jupiter formed before a planet could form from these planetesimals. Because of the large mass of Jupiter, orbital resonances with Jupiter govern orbits in the asteroid belt. These resonances either scattered the planetesimals away from the asteroid belt or held them in narrow orbital bands and prevented them from consolidating. What remains are the last of the planetesimals created initially during the formation of the solar system. The effects of Jupiter have scattered most of the original contents of the asteroid belt, leaving less than the equivalent of 1/10th of the mass of the Earth. The loss of mass is the chief factor that prevents the asteroid belt from consolidating into a planet. Objects with very large mass have a gravitational field great enough to prevent the the loss of large amounts of material as a result of a violent collision. In the asteroid belt this usually is not the case. As a result, many larger objects have been broken apart, and sometimes newer objects have been forced out of the remnants in less violent collisions. Evidence of collisions can be found in the moons around some asteroids, which currently can only be explained as being consolidations of material flung away from the parent object without enough energy to escape it. Image showing Outer Planets and Kuiper Belt: a)Before Jupiter/Saturn 2:1 resonance b)Scattering of Kuiper Belt objects into the solar system after the orbital shift of Neptune c)After ejection of Kuiper Belt bodies by Jupiter. The outer solar system is now believed to have been shaped by planetary migrations. As the gravity of the planets perturbed the orbits of the Kuiper belt objects, many were scattered inwards by Saturn, Uranus, and Neptune, while Jupiter often kicked those objects out of the solar system altogether. As a result, Jupiter migrated inwards while Saturn, Uranus, and Neptune migrated outwards. A major breakthrough in the understanding of how this lead to the current solar system structure occurred in 2004. In that year, new computer models showed that if Jupiter started out taking fewer than two orbits around the Sun for every time that Saturn orbited the Sun once, this migration pattern would put Jupiter and Saturn into a 2:1 resonance when the orbital period of Jupiter became exactly half that of Saturn's. This resonance would have put Uranus and Neptune into highly elliptical orbits, with there being a 50% chance that they would have exchanged places. The object which ended up being outermost (Neptune) would then be forced outwards into the Kuiper belt as it initially existed. The subsequent interaction between the planets and the Kuiper belt after Jupiter and Saturn passed through the 2:1 resonance can explain the orbital charactertistics and axial tilts of the giant outer planets. Uranus and Saturn end up where they are due to interations with Jupiter and each other, while Neptune ended up at its current location because that is where the Kuiper Belt initially ended. The scattering of Kuiper belt objects could explain the Late Heavy Bombardment which occurred approximately 4 billion years ago. Kuiper belt and Oort cloud of the solar system. The Kuiper Belt was initially an outer region of icy bodies which lacked enough of a mass density to consolidate. Originally its inner edge would have been just beyond the outermost of Uranus and Neptune when they formed. (This is most likely in the range of 15 - 20 A.U.) The outer edge was at approximately 30 A.U. The Kupier Belt initially "leaked" objects into the outer solar system, and caused the initial planetary migrations. The Jupiter-Saturn 2:1 orbital resonance caused Neptune to plow into the Kupier belt, scattering most of the objects. Many of these objects were scattered inwards, until they interacted with Jupiter and most often were placed into highly elliptical orbits or even ejected outright from the solar system. The objects which ended up in highly elliptical orbits form the Oort cloud. Closer in, some objects were scattered outwards by Neptune, and those form the scattered disk portion of the kuiper belt objects. Moons of the solar system. co-formation from a proto-planetary disk (peculiar to the gas giants),. formation from impact debris (given a large enough impact at a shallow angle), and. The gas giants tend to have inner moon systems which originated from the a proto-planetary disk. This is indicated by the large sizes of the moons and their proximity to the planet. (These attributes are impossible to achieve via capture, while the gaseous nature of the primaries make formation from collision debris another impossibility.) The outer moons of the gas giants tend to be small and have orbits which are elliptical and have arbitrary inclinations. These features are appropriate for captured bodies. For the inner planets and other solid solar system bodies, collisions appear to be the main creator of moons, with a percentage of the material kicked up by the collision ending up in orbit and coalescing into one or more moons. The Moon is believed to have formed in this way. A planet can also create a tidal bulge in a moon, and this will slow down the moon's rotation until its rotation period becomes the same as its revolution period. Thus, the moon will keep one side of itself facing the planet, as is the case for the Moon. This is called tidal locking and is present in many other moons in the Solar System such as Jupiter's satellite Io. In the case of Pluto and Charon, both the primary and the satellite are tidally locked to each other. Future of the solar system. artist's impression of the future evolution of our Sun. Left: main sequence; middle: red giant; right: white dwarf. 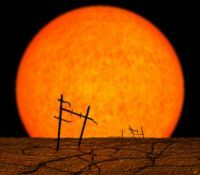 artist's impression of the remains of artificial structures on the Earth after the Sun enters its red giant phase and swells to roughly 100 times its current size. 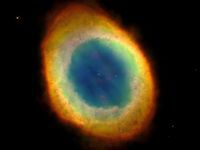 The Ring nebula, a planetary nebula similar to what the Sun will eventually become. Barring some unforeseeable accident, such as the arrival of a rogue black hole or star into its territory, astronomers estimate that the solar system as we know it today will last another billion years or so, whereupon the Sun will claim its first casualty, the Earth. As the Sun brightens a further ten percent beyond today's levels, its radiation output will increase, gradually searing the Earth until its land surface becomes uninhabitable, though life could still survive in the deeper oceans. Within 3.5 billion years, Earth will attain surface conditions similar to Venus's today; the oceans will boil, and all life (in known forms) will be impossible. Five billion or so years from now, the hydrogen reserves within the Sun's core will be spent, and it will begin to use those in its less dense upper layers. This will require it to expand to eighty times its current diameter, and, about 7.5 billion years from now, to become a red giant, cooled and dulled by its vastly increased surface area. As the Sun expands, it will swallow the planet Mercury. Earth and Venus, however, are expected to survive, since the Sun will lose about 28 percent of its mass, and its lower gravity will send them into higher orbits. Earth will be left a scorched cinder, its land surface reduced to the consistency of hot clay by sunlight a thousand times more powerful than today's, and its atmosphere stripped away by a now-ferocious solar wind. The Sun is expected to remain in a red giant phase for about a hundred million years. During this time, it is possible that the watery worlds around Jupiter and Saturn, such as Titan and Europa, might achieve conditions similar to those required for current human life. Eventually, the helium produced in the shell will fall back into the core, increasing the density until it reaches the levels needed to fuse helium into carbon. The Sun will then shrink to slightly larger than its original radius, as its energy source has fallen back to its core, however, due to the relative rarity of helium as opposed to hydrogen, the helium-fusing stage will only last about 100 million years. Eventually it will have to again resort to its reserves in its outer layers, and will regain its red giant form. This phase lasts only 100 million years, after which, over the course of a further 100,000 years, the Sun's outer layers will fall away, ejecting a vast stream of matter into space and forming a halo known (misleadingly) as a Planetary nebula. This is a relatively peaceful event; nothing akin to a supernova, which our Sun is too small to ever undergo. Earthlings, if we are still alive to witness this occurrence, would observe a massive increase in the speed of the solar wind, but not enough to destroy the Earth completely. Eventually, all that will remain of the Sun is a White Dwarf, a hot, dim and extraordinarily dense object; half its original mass but only the size of the Earth. Were it viewed from Earth's surface, it would be a point of light the size of Venus with the brightness of a hundred current Suns. As the Sun dies, its gravitational pull on the orbiting planets, comets and asteroids will weaken. Earth and the other planets' orbits will expand. When the sun becomes a white dwarf, the solar system's final configuration will be reached: Mercury will have long since ceased to exist; Venus will lie roughly a third again farther out than Earth is now, and Earth's orbit will roughly equal that of Mars today. Two billion years farther on, the carbon in the Sun's core will crystallize, transforming it into a giant diamond. Eventually, after trillions more years, it will fade and die, finally ceasing to shine altogether. History of solar system formation hypotheses. During the late-19th century the Kant-Laplace nebular hypothesis was criticized by James Clerk Maxwell, who showed that if matter of the known planets had once been distributed around the Sun in the form of a disk, forces of differential rotation would have prevented the condensation of individual planets. Another objection was that the Sun possesses less angular momentum than the Kant-Laplace model indicated. For several decades, most astronomers preferred the near-collision hypothesis, in which the planets were considered to have been formed due to the approach of some other star to the Sun. This near-miss would have drawn large amounts of matter out of the Sun and the other star by their mutual tidal forces, which could have then condensed into planets. Objections to the near-collision hypothesis were also raised and, during the 1940s, the nebular model was improved such that it became broadly accepted. In the modified version, the mass of the original protoplanet was assumed to be larger, and the angular momentum discrepancy was attributed to magnetic forces. That is, the young Sun transferred some angular momentum to the protoplanetary disk and planetesimals through Alvén waves, as is understood to occur in T Tauri stars. The refined nebular model was developed based entirely on observations of our own solar system, because it was the only one known until the mid 1990's. It was not confidently assumed to be widely applicable to other planetary systems, although scientists were anxious to test the nebular model by finding of protoplanetary disks or even planets around other stars, so-called extrasolar planets. Stellar nebula or protoplanetary disks have now been observed in the Orion Nebula, and other star-forming regions, by astronomers using the Hubble Space Telescope. Some of these are as large as 1000 AU in diameter. As of November 2006, the discovery of over 200 exoplanets has turned up many surprises, and the nebular model must be revised to account for these discovered planetary systems, or new models considered. There is no consensus on how to explain the observed 'hot Jupiters,' but one leading idea is that of planetary migration. This idea is that planets must be able to migrate from their initial orbit to one nearer their star, by any of several possible physical processes, such as orbital friction while the protoplanetary disk is still full of hydrogen and helium gas. In recent years, an alternative model for the formation of the solar system, the Capture Theory, has been developed. It is claimed that this model explains features of the solar system not explained by the Solar Nebula Theory.